JabRef cooperates with Mr. DLib to provide literature recommendations to its users. If you are a user of JabRef, you might be interested in the following information and explanations of how Mr. DLib works. Whenever you open the “related-articles” tab in JabRef (and only then), the title of your currently selected document is transferred to the servers of Mr. DLib. Our recommender system searches for a list of related articles in Mr. DLib’s database, and returns that list to you. If you use the “related-article” function, JabRef also sends additional information to Mr. DLib. This includes the JabRef version you are using, the language of JabRef, your time zone, JAVA version, screen resolution, and operating system and version. We use this information to enhance the recommendations (e.g. favouring documents in your language, or applying collaborative filtering and machine learning based on our operating system and other attributes), and generating statistics about the usage of our service. Your IP address is also stored to prevent misuse of our service, i.e. too many queries and bots. Mr. DLib operates a living lab to take advantage of the latest recommendation technologies, and help the research community. Mr. DLib may share some data (including the query titles) with these partners to get recommendations. Please also note that we may publish anonymous datasets about Mr. DLib, though these will NOT contain any of your sensitive information (e.g. the title of your query document or IP address). If you have any questions about Mr. DLib’s recommender system, please contact us. 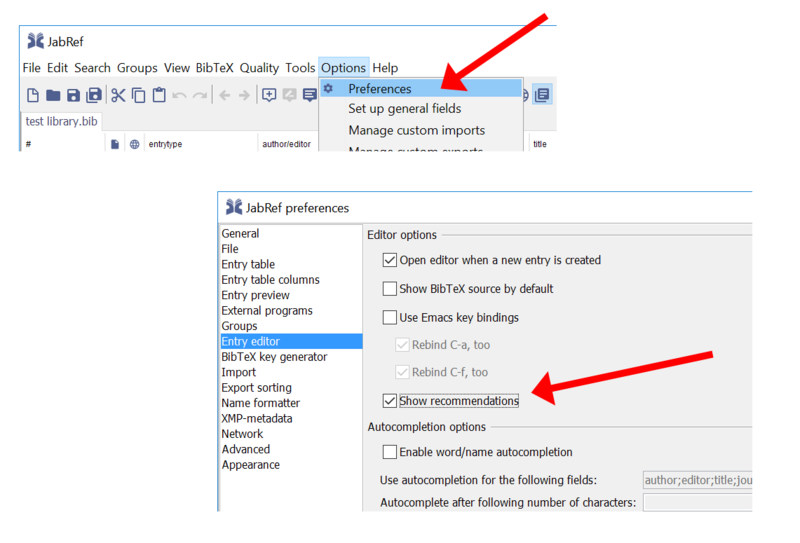 If you do not want to have the ‘Related articles’ tab in JabRef, you can easily de-activate it: Options -> Preferences -> Entry Editor -> Uncheck ‘Show recommendations’. Consequently, if the tab is not shown, no data ever will be transferred to Mr. DLib.